Here’s Lilly Allen doing a cover of Blondie’s “Heart of Glass” at Bonnaroo. Cat Power (whose real name is Chan Marshall), has become the first woman to be awarded the Shortlist Music Prize. The singer/songwriter won with her newest release and best work (in my opinion) The Greatest. The album beat out veteran Tom Waits and eight other finalists releases such as Band of Horses, Beirut, Bonnie Prince Billy, Cat Power, Girl Talk, Hot Chip, Joanna Newsom, Regina Spektor, and Spank Rock. 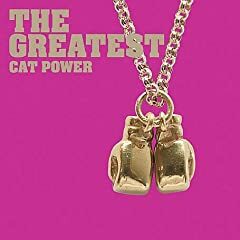 The album, “The Greatest” opened last year at No. 34 on The Billboard 200, which was recorded in Memphis with veteran session musicians Teenie and Leroy Hodges, and Steve Potts. The album was released in January 2006 on Matador Records, the label she’s been with since 1996. The Shortlist Prize honors acts that have made sterling albums released in the US, but have not yet hit the mainstream. The prize is determined by votes amongst peers. This years judges were Gary Lightbody (from Snow Patrol), Ronnie Vannucci (The Killers), Wayne Coyne (The Flaming Lips), KT Tunstall, Franz Ferdinand, and Panic! At The Disco. In Los Angeles, where the awards are held, Sigur Ros was the first to be awarded the prize in 2001. Other winners include N*E*R*D, Damien Rice and TV On The Radio. Chan pronounced (shawn), says the album marks a new chapter of sobriety in her life. Noticed by her much stronger stage performance, which was sometimes impaired by her abuse of drugs and alcohol. Juliette Commagere, Jared Smith, Joachim Cooder and Robert may still be strangers to you, but soon enough you just may come to know L.A.’s indie band that’s been generating a strong buzz and when you meet them you’ll say, “Hello Stranger”. Mike Elizondo, who has produced such albums as Fiona Apple’s second version of “Extraordinary Machine” and Maroon 5’s latest work; has stepped in on a few tracks. Elizondo has beeen known to offer a hit inducing vibe of familiarity to abstract work, thus the reason he was chosen for the revamp of Fiona’s album, Extraordinary Machine after she had worked with producer Jon Brion. Elizondo has also worked with Nelly Furtado, Eminem, 50 Cent, Alanis Morrissete and Pink. Legendary producer Ry Cooder, Joachim’s father, actually produced the album. Words are Just Words Until They Hit Home but Isnt that the Idea? A person would almost have to be living in some remote cave not to have picked up on the recent controversies surrounding words that defame, hurt, or cut like a knife. First, it was an international star that made the international news scene, followed by a world class comedian, and then a very popular disc jockey, talk show host. All of whom have apologized and all of which have lost some of the adoration and love of their fan base. Words have such power and when they are combined with music they can and many times do communicate deeply within our very being, sometimes resonating long after the song is over in our minds. Who hasnt been told by a friend or work colleague that they are humming or lightly singing some refrain from a tune that is stuck in their head – and it doesnt even have to be something from your recent past, either. The Beatles sang, all we need is love and Alice Cooper told us that only women bleed and we learned about another brick in the wall by Pink Floyd. These were social commentaries presented through music that music lovers picked up on and repeated over and over again. Words have such power. Music by itself has such tremendous powers of its own and here the word “power” could never be over-emphasized when describing its inherent abilities. But yet, when combined with language, with words, the power, the brute force, even the lightest massage is magnified, and there indeed can be found the magnified rub. Years ago the national PBS icon, Bill Moyers, produced a startling documentary entitled, Amazing Grace. The song has been around since John Newton penned it after he was almost killed at sea during a dreaded storm. John Newton was a slave trader and he was so emotionally moved by this amazing grace that he penned his words which forever hits the hearts and minds of listeners worldwide. But central to our point, Bill Moyers interviewed all kinds of musicians and singers, each whose delivery of the words were done somewhat differently than the others. The words were the same, with the exception of some possible paraphrasing here and there, but the point that Mr. Moyers wanted to convey was that it was the collaboration of the tune and the words and the artists that continually breath new life into this tune over the ages. Its music is redefined for specific audiences, but yet everybody who listens to that tune is motivated to some degree. When it comes to music by itself, how could anyone not appreciate Carlos Santanas rendition of Europa or Kenny Gs riffs, or the music of soul artists like Isaac Hayes? Music is not contemporary; it is timeless. Who was the first rock star, Wolfgang Mozart perhaps, the youthful prodigy that dared to please audiences with fresh, new, untraditional tunes that got him into such huge trouble with the establishment? Wofie got into trouble because music has power, power to move the masses, to excite them, to sadden them, to motivate them. He frightened the political establishment of his day because when music is combined with words, lyrics, it has an exacting power and he knew it. Is it just me? Or does it seem like every time you turn on the radio, you hear more commercials and dj’s, than music? I’m fortunate in the fact that I have satellite radio in my home, and my car, so I’m not often forced to hear terrestrial radio. But when I am placed in that situation, I realize why I left it behind. The same old commercials, and the same old songs played endlessly. I recently sat through a few hours of radio while visiting a friend. I heard one particular song 5 TIMES! This, in around 3 hours, on the same station. I understand they have to play the hits, but Jesus Christ, can we at least limit them to once per hour? Besides the fact that I hear the same songs over and over, there are the endless commercials. I timed a commercial segment that ran on for over 6 minutes! That may not seem like very long, but think about it this way. When you watch television, you know how the commercials seem to last forever? Well, television spots generally run between 2 to 3 minutes. Imagine if they were twice as long. That’s radio for you. If you don’t have satellite radio, I hope you have a CD player in your car and/or home. That way, you can choose what you hear. I get bored with satellite radio occasionally, so I’ll pop in a mix CD I burned myself. And I love to seek out new music, from new bands. So I comb the internet for music that’s interesting, and then try to find copies of the music I like. If you’re adventurous too, then seek out new music. Explore every avenue at your disposal, and you’ll find that the best music isn’t played on the radio, but is hidden, and awaiting your arrival.